By Yannis Tsirbas In Books Tagged In Athens, globalization, Greece, literature in translation, Racism, Vic City Express, and Yannis Tsirbas. Pre order now — Pub date: 15 Sept. This story could happen anywhere. Today the place is Greece, wracked by a crisis that has pushed people to the brink. Two strangers meet in a train headed for Athens. One spews out his disgust at the foreigners and the poverty that have invaded the neighborhood he calls home, Vic City. He even has a “final solution” in mind. The other, seized by fright—or is it resignation and apathy?— squirms as his haughty silence gives way to voyeurism and to political correctness. While the former, uninhibited, lashes out at the economic crisis in a violent racist rant, the latter, troubled, checks his email about the latest health treatments aimed at him and his family. Along the way, we get glimpses of the forces that have destroyed a society and left people rudderless. Vic City Express seizes the anxieties of our dystopian globalized world. Yannis Tsirbas is a novelist and playwright born in Athens in 1976. His short stories have received national awards. 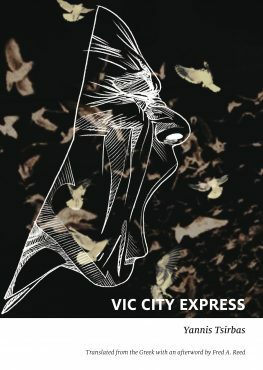 Vic City Express (2013, Nefeli) was short listed for the Greek National Literature Award. He was also the co-screenwriter of the award-winning movie Amerika Square, which was based on Vic City Express. Yannis Tsirbas also lectures in Political Science and Public Administration at the University of Athens. Fred A. Reed is a three-time winner of the Governor General’s Award for translation from French to English. His Greek-to-English translations include works by Nikos Kazantzakis. In addition to translating, he is a respected specialist on politics in the Middle East and is the author of seven books of nonfiction.